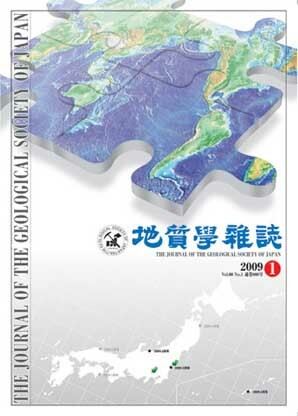 The Journal of the Geological Society of Japan (JGSJ) is issued monthly by the Geological Society of Japan (est. 1893), which is the largest society of its type in Japan, with approximately 4300 members. The JGSJ publishes original research papers in geology and related fields in the form of Articles (Ronsetsu in Japanese) or Short Articles (Tanpou), and publishes reviews of research and technical advances as Review Articles (Sohsetsu) or Notes (Nohto), in either English or Japanese. The journal places an emphasis on publishing original, novel, and widely applicable scientific results, techniques, theory, and ideas, and attaches great importance to descriptions of regional geology, both in Japan and internationally. The journal also welcomes research papers concerned with natural resources, the environment, and hazards, as well as geology education. To advance the quality of the journal and ensure the timely publication of a rich variety of material, the journal is served by a full Editorial Board comprising many active researchers in various fields. affiliations, abstract, keywords, and reference list, which ensures easy searching and access. To maximize efficiency, the journal employs an on-line submission and peer-review system. For the archiving of past issues of the journal and for the on-line submission and peer-review system mentioned above, the journal employs J-STAGE (Japan Science and Technology Information Aggregator, Electronic), as established by the Japan Science and Technology Agency (JST) (see http://www.jstage.jst.go.jp/browse/geosoc). For all papers in JGSJ, bibliographic information (title, authors’ names and affiliations, abstract, keywords, and reference list) is provided in English, as well as captions and legends for the figures and tables, thereby providing access to readers across the world. Over the past 5 years since 2004, 14 papers (3.8% of the total papers) have dealt with geology outside of Japan and 5 foreign authors (1.3%) have published in the journal. When Pictorials are taken into account, these figures increase to 46 papers (12.4%) and 25 foreign authors (6.7%), respectively, providing an indication of the potential for international contributions as full papers (e.g., Articles and Short Articles). The number of citations of JGSJ papers (as assessed using the Cited Reference Search as part of the Web of Science) shows an increasing trend, from about 10 per year in the 1960s to 60–80 per year or more in the 2000s. Most of the members of the Editorial Board are active researchers at the forefront of their respective international communities, covering numerous fields related to geology and earth science. For special issues, members of the editorial board work together with guest editors in the review and publication process, thereby ensuring the timely publication of high-quality papers on specific topics.